This wanderlust persona has been further “activated” by the summer season, much like a Ms. Hyde waiting to come out after months of toiling in work and (my kids’) school activities. Our beloved city of Pines is not spared from scorching hot sunny weather at high noon, although we are now experiencing April showers in the afternoons. Since we had our Bolinao trip in 2011, the whole family has been somewhat bitten by the travel bug. Hubby and I since then promised our Tres Mikaelas that we will make it a point to go somewhere new at least once every year, and so far we have been faithfully complying with that promise. 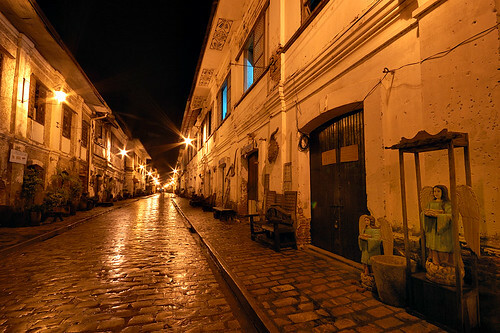 The highlight of my Vigan visit was strolling at Calle Crisologo at night, shopping (!) and taking loads and loads of pictures at every corner. Hubby felt frustrated not being able to taste the authentic Vigan empanada that time, because we were supposed to get a number (#43! At the time they were serving only #17! ), that we had to get up really early to be first in line the next day. But yes, that newly-cooked, oil-laden, tongue-burning Vigan empanada was worth waking up early for. After bidding Grandpa’s Inn goodbye (with me whispering a promise to return soon…), we set out for Laoag City where we would be shown around by Hubby’s college buddy. We had no idea we were in for a really great adventure.